This book points out the tragic situation of so many today. They think they are on their way to Heaven; but, they are not; as, they have not heard the clear Gospel of Grace. They are victims of those who preach a message of salvation mixed with human effort, and their ultimate end will be the Lake of Fire! Unless someone reaches them with the truth, they will hear the devastating words, “Depart from me, ye cursed, into everlasting fire, prepared for the devil and his angels” (Matthew 25:41). That is the message of this book. Bowen documents the so-called “salvation” messages of some of the “great” pastors and evangelists of today, which do not give eternal life. He compares them to the message of Christ, which does give eternal life. He makes his comparisons respectfully, considering that these pastors and evangelists are just as deceived by Satan, the Father of Lies, as are their followers by the message they preach. Here is the list of individuals he gives “The Plan of Salvation According to”: Joel Osteen, Charles Stanley, Pat Robertson, Rick Warren, John Hagee, Beth Moore, James Dobson, Jimmy Swaggart, Ray Comfort and Kirk Cameron; and, Franklin and Billy Graham. Read the PDF online; or, if you wish to purchase your own copy of the book, it is available on Amazon.com. Read the book! You won't be disappointed. I am glad that Michael Bowen has shared his personal pain, hardships and great losses with the world. 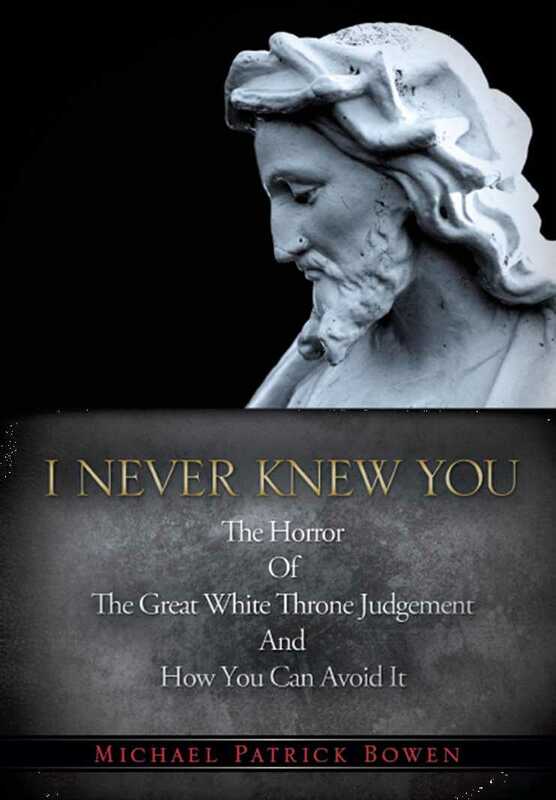 I've known people who committed suicide because of similar circumstances; yet Michael Bowen has turned his grief and pain into a needful and doctrinally sound book to honor the Lord Jesus Christ. Michael's love of 8-years, Debbie, just up and left him for another, devastating his heart. After more than a decade of depression, Michael met Cristy, who dumped him; and then Lora, who also left him without warning. All three women dumped Michael, after he gave his heart to them. After much heart-searching, Michael Bowen realized that God had a purpose for all his afflictions and losses, that is, God was teaching Him that Christ will dump anyone at The Great White Throne Of Judgment who hasn't obeyed the Gospel. Giving one's best to Jesus isn't good enough. Devoting one's life to Christ isn't salvation. Seeking a relationship with Christ or becoming one of His disciples is not the way of salvation. Jesus died on the cross, He was buried and bodily resurrected 72 hours later. That is “the Gospel” according to 1st Corinthians 15:1-4. Romans 1:16a teaches that we are saved by believing the Gospel, which is “the power of God unto salvation, to them that believe.” If you by faith receive Christ's sacrifice on the cross as payment for your sins, believing that He raised up bodily from the dead the third day, you are saved. I read in chapter 7 where Michael lost 20 pounds due to sorrow in the loss of his second love, Cristy, which I related to, for I have had painful experiences in my own life which caused me to lose considerable weight. I once lost 30 pounds because of marriage problems, when my wife abandoned me for a month. I thought it was over. I simply lost my appetite due to emotional trauma. There is no pain like rejection or betrayal by loved ones. I didn't expect to read such things in a book about salvation, but was pleasantly surprised and am thankful for Michael Bowen being so transparent in his testimony. My own beloved wife of 18 years (1987-2006) abandoned me in 2006, filing for divorce. I was devastated. Long story short—I lost my home, I lost most of my possessions, I lost my retirement, I lost my pets, and to an extent, I lost my mind for a time. It's a long and painful story. I've never remarried. I have lived alone, with no girlfriend, for the past 10 years. It's now 2016. I often am lonely, but Jesus is the love of my life. Brother Bowen's book encouraged me in my own pain and suffering, that I'm not alone. Most people are reluctant to share their pain with others. I recommend this book to everyone. I have suffered pains worse than death myself, emotionally and bodily. My online ministry was born out of adversity and has continued through much afflictions. My neck pain and stiffness will be with me until the grave. It makes me moody and irritable, which makes it next to impossible to be around people. I am a loner. The radiating neck pain always irritates me, being so close to my head, affecting my entire facial area with dull constant pain. Although there are no direct connecting nerves from the neck into the face, any good pain specialist will confirm that if the pain is chronic enough it will radiate into the facial area. It is a heavy burden that never goes away. Yet, God's rainbow shines through the storm. God's promises are the silver lining in every storm cloud. My online ministry is my escape from my pain and afflictions. I am not wasting my suffering. I am using it to honor the Lord. Repentance is often misunderstood these days. It is quite ironic that the ministers who accuse us fundamental preachers of teaching easy believism, are the very ones whom Jesus warned about in Matthew 7:21-23... “Depart from Me, ye cursed, for I never knew you.” Why? It's because they failed to do the will of the Father, which according to John 6:40 is to believe on the name of the Lord Jesus Christ. Many say, “Lord, Lord,” but think they'll get to Heaven by “the life they live” as John MacArthur so teaches in his deadly book titled, HARD TO BELIEVE. The book doesn't expose John MacArthur per se, but the chapter on Ray Comfort reflects MacArthur's beliefs well. Pastor John MacArthur's HERESY TO YOU radio show (“Grace To You”) is heard nationwide and is deceiving millions of people with a false gospel of making Jesus “Lord” to be saved. Pastor Robert B. Thieme Jr. mentored John MacArthur, and then MacArthur mentored Ray Comfort and Kirk Cameron. MacArthur's corrupt study Bible is promoted on Kirk Cameron's website, as well as on Living Waters and Way Of The Master by Ray Comfort. Is John MacArthur a Seventh Day Adventist? Or maybe MacArthur's a Mormon? It's frightening when one of America's most dynamic, beloved, popular and in-demand pulpiteers teaches the same doctrines concerning salvation as do Seventh Day Adventists, Mormons and even Roman Catholics. Lordship Salvation doesn't offend Catholics, because it teaches that works are required for salvation. As typical with false prophets, they say “no” while meaning “yes.” It's all double-speak, a forked-tongue false Gospel. MacArthur foolishly teaches that it is hard to become a Christian, because he says it will cost you your life of worldliness, sinful bad habits and selfish ambitions to make your faith valid. Clearly he does not believe that faith alone in Christ is enough to be saved. The thief on the cross was saved immediately when he believed on Christ, saying “Remember me” to Jesus (Luke 23:42). We are saved solely by faith in Christ, which may or may not be expressed by words. Believing happens in the heart, not the mouth. Words are not required to be saved. We are saved the moment we believe (trust) in our heart that Jesus is the Christ Who died FOR OUR SINS on the cross, was buried, and bodily resurrected 72 hours later (1st Corinthians 15:1-4). We are saved by receiving Christ's sacrifice on the cross as payment for our sins, believing that He raised up from the dead three days later. The only requirement to be saved is to acknowledge your sinnership, judging yourself as a needy sinner in the sight of a holy God (Romans 3:19). Otherwise, why would you need a Savior? No one has ever been saved who didn't know that he is a sinner (1st John 1:8-10). But that is the only requirement. You need to know what you are being saved from. You don't have to forsake sinful behavior, or turn from sins, or repent from sins, or be willing to turn from sins, to receive the free gift of forgiveness of sins and eternal life. That would constitute works. You cannot show me anywhere in the Holy Scriptures where it teaches to “repent from sins” or “turn from sins” to be saved. To be born-again, you simply admit that you are a sinner and believe the Gospel (Mark 1:15). The Devil is so subtle. Satan knows that people will reject a lie if it is too obvious, so he hides a lie amongst truth to disguise it. For example: I've heard false prophets teach that you're saved by grace through faith, but your faith is not valid unless there are works to make that faith credible (i.e., to authenticate it). This is a backdoor approach to a works-based salvation. If my salvation is conditioned upon my obedient behavior, then I am only placing partial faith in Christ. If I have to cease from sinful behavior to be saved, then human effort is necessary for salvation. That flies in the face of everything the Word of God teaches. And by the way, the only inspired Words of God today in the English-speaking language are in the King James Bible. All of the modern Bible revisions are corrupted by Satan, perverting the meaning of salvation. Romans 11:6 plainly argues that it cannot be both. Salvation's either by grace or works, but it cannot be BOTH. Lordship Salvation is by self-righteous works. Biblical salvation is by grace alone without works. The life we live has absolutely NOTHING to do with the gift of eternal life. The word “gift” is the key word in salvation. God offers eternal life freely to all mankind, with no strings attached, no heavy burdens, no worries not uncertainties. Ray Comfort, Paul Washer, Kirk Cameron, and John MacArthur are all Calvinist in their doctrine (whether they admit it or not). MacArthur boasts of being a 5-point Calvinist. Truly, Calvinism and John Calvin are of the Devil. These men are all making salvation hard for others. In sharp contrast, Jesus bore the weight of our sins upon the cross, so we wouldn't have to pay for our sins in Hell forever. The unbiblical requirement of making Jesus “Lord” of one's life to be saved places a heavy burden upon the sinner's shoulder to amend their way, leave off sinful bad habits, turn over a new leaf, forsake the world, make a commitment to Christ, get water baptized, and so forth. These are all proper in their place, but do not constitute salvation. In fact, adding even one of them to the gospel message perverts it and it cannot save anybody. As Michael Bowen explains in his book on page 23, altering the plan of salvation is akin to crossing out the selling price of a contract to buy a home, writing a lower price instead, which would negate the entire contract. When the televangelists and ministers alter God's simple plan of salvation, they negate the gift of God. The “greats” have it wrong! I recently watched some religious films that have sold millions of copies: The Moment After and The Moment After II. Both films corrupt the gospel by adding making Jesus Lord, living for Christ; but they fail to include the death, burial and resurrection. 1st Corinthians 15:1-4 defines the gospel for us, so there is no guess work involved. Jesus DIED, was BURIED and then ROSE again three days later. If you acknowledge your guilt of sin before God (Romans 3:19) and receive the gospel as payment for your sins, then you are saved. It's that simple. The gospel plus faith equals salvation. The enemy is Satan who hates all people, saved and unsaved alike, and wants to lure as many people into the Lake of Fire (Gehenna) with him as possible to be punished for ever and ever. Just as Joel Osteen, likewise Ray Comfort, John Hagee, Charles Stanley and other “greats” of our generation are not bad people, they are sincere; but they are sincerely wrong about the gospel. In one of his sermons, Joel Osteen once asked his church audience where they would spend eternity if they died that moment. Clearly, Osteen does care if his congregation goes to Heaven or Hell. Albeit, Osteen's errant way of salvation is to repent of sins, ask Jesus into our hearts, ask Him to wash us clean, and make Him Lord of our life. Osteen hasn't even begun to mention the gospel. Instead, Joel Osteen has added a bunch of requirements that God did not. 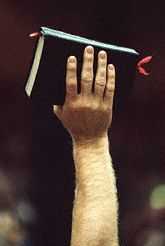 Changing the gospel even in the slightest way negates it completely and there can be no salvation. The gospel is that Jesus Christ died, was buried and has been resurrected (these three things are the gospel). The gospel does not include making Jesus ones “Lord.” The gospel does not include amending one's ways, nor joining a church through water baptism, nor keeping sacraments. It is a simple matter of heart's faith in what Christ has done to pay for our sins. If you come as a sinner and trust upon the Savior Who died, was buried and bodily arose again, then you are saved my friend. We go to Heaven because we trust what Christ did for us; and not because of what we can do for Him. Our best righteousness is filth to God (Isaiah 64:6). We need HIS RIGHTEOUSNESS, that is, Christ's imputed righteousness (Matthew 6:33; 2nd Corinthians 5:21). Oh how foolish is the world today! Billions of unsaved religious people are headed for the Lake of Fire! A demon's favorite activity is to make an unsaved person feel religious. Wrong! Salvation is receiving, NOT giving. Mr. Tozer requires sinners to “reform” themselves before they can be saved. This goes totally contrary to the plainest teaching in the Bible. Romans 4:5 states: “But to him that worketh not, but believeth on him that justifieth the ungodly, his faith is counted for righteousness.” Pastor Tozer is teaching works salvation!!! Salvation is a free gift (Romans 5:15; 6:23)—freely offered (Romans 10:13) and freely received (Revelation 22:17).